At the Community Kitchen Academy in Burlington last Thursday, Jim Logan's cooking tips to his students seemed applicable to life in general. "Risotto waits for nobody. When it's done, it's done," he said. "It's time to take it off the heat." As the students in the culinary job training program prepared grain dishes, Logan walked around the kitchen, supervising them with eagle eyes. He reminded them to wet put paper towels under their chopping boards to prevent them from sliding around. He praised a student for slicing red onions into equal-size pieces. He stopped another student midway through making vinaigrette and told him to put on his chef cap. 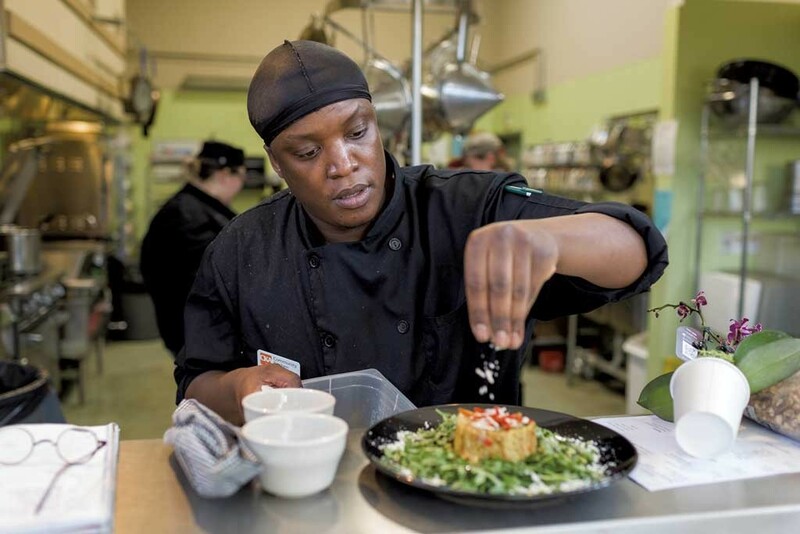 Since last May, Logan has been chef instructor at the Community Kitchen Academy in Burlington. A program of the Vermont Foodbank, it takes place at the Chittenden Emergency Food Shelf in Burlington and at Capstone Community Action in Barre. The idea behind the academy is to prepare underemployed and unemployed individuals for careers in the food service industry. Since the program began in 2009 in Burlington, and in 2013 in Barre, 271 students have graduated. They attend free of charge. "It's a great opportunity," said Tiffany Ellen Rich. The recent academy graduate is now Logan's temporary assistant chef. "They're trying to help underpaid and underemployed Vermonters get jobs that are going to pay them well, treat them good," she added. The program does more than provide food-biz training; it also instills in students a sense of confidence through community service. Because of the Vermont Foodbank's relationship with supermarket chains, independent grocery stores, co-ops, large caterers and hotels, academy students are able to utilize and transform donated food that might otherwise go to waste. They learn how to prepare nutritious dishes and serve them to neighbors in their communities via food-assistance programs. "I get a lot of satisfaction when I see somebody really enjoy [the food]," said current student Michael Hammond of Burlington. "All that preparation was for something, you know." By all accounts, the 13-week program is intensive. Each student receives a weekly stipend of $75 to help with transportation and other expenses. By the time of graduation, a student will have acquired about 300 hours of instruction and production, a week of internship at a food establishment, and guidance on job-interview skills and résumé-writing. They also obtain certification in ServSafe, a nationally recognized educational program administered by the National Restaurant Association. Those who intend to pursue higher education can earn nine college credits through the academy. In Burlington, lessons are held at the food shelf's quarters on North Winooski Avenue Monday through Thursday, 10 a.m. to 5 p.m. The cafeteria in which the nonprofit operates a soup kitchen every morning becomes the classroom. The room has no projectors or smart boards. Instead, two colorful quilts and "Hate Has No Home Here" posters adorn the walls. But if the Community Kitchen Academy lacks fancy equipment, Logan makes up for it with dedication. "It takes a special person to understand how to be respectful and caring in the way [Logan] does," said food shelf director Rob Meehan. Logan has worked for about 40 years in the food industry. 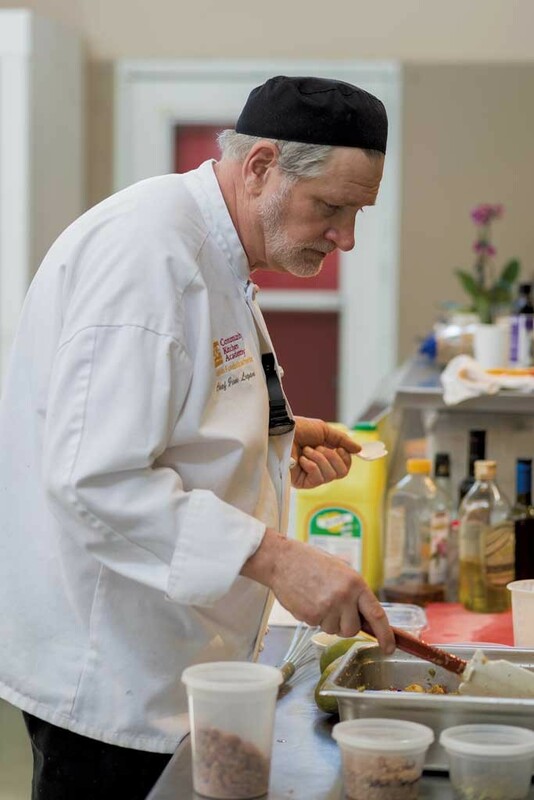 He's taught at the New England Culinary Institute and was chef manager of Middlebury College's Bread Loaf School of English. His position at the academy is about him "giving back a little more and not just think[ing] about furthering myself up the career [ladder]," Logan said. "I do love teaching," he added. "I love the process, because they are not going to be the same students as they were yesterday." Logan's third class has seven students, and he interviewed each of them as part of the application process. "What we look for is motivation," the chef explained. "We look for a really strong desire to want to make something better, do something different." Both Meehan and Logan remember an Iraqi student, Sahar Alsammraee, from Logan's first class. Though she isn't proficient in English, that didn't stop Alsammraee from participating in the program, they noted. She used a translator app on her phone during class and took pride in her work, said Logan. These days, Alsammraee is busy with her catering business, he said. She's also leading a sold-out culinary class at City Market, Onion River Co-op's Community Teaching Kitchen next month. A current student interested in starting her own business is Maya Gurung-Subba. The Burlington resident was born in Bhutan and lived in a refugee camp in Nepal for 17 years before resettling in Vermont in 2008. 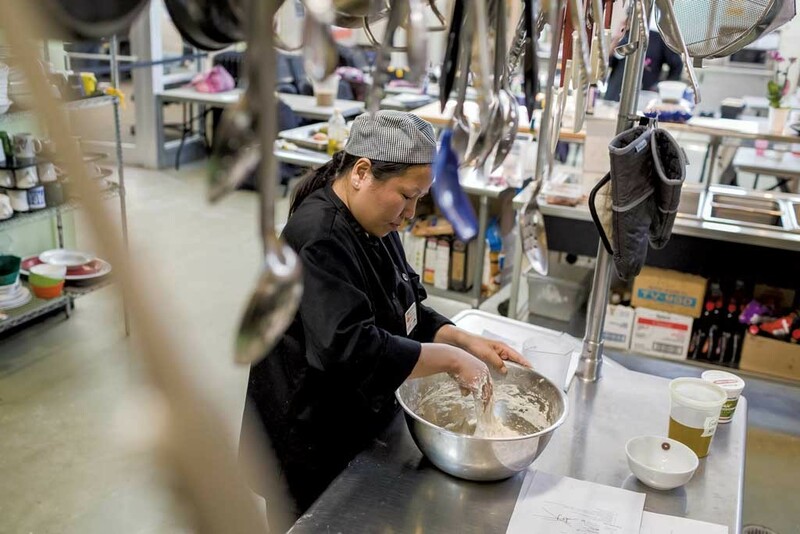 After working as a licensed nursing assistant for almost eight years, Gurung-Subba decided that she wanted to enroll in a culinary school. She searched online for a suitable program and learned about NECI in Montpelier. Because she thought the location was too far away, she continued looking and discovered the Community Kitchen Academy through Facebook. "I'm learning every day new techniques," Gurung-Subba said. She plans to open an Asian restaurant with her husband, who works at A Single Pebble, a Chinese restaurant in Burlington. Students typically learn about the academy through referrals from other social services providers. For instance, Lacey Lawley decided to apply for the program after a staffer at Spectrum Youth & Family Services recommended it. "For me, cooking is really relaxing," said Lawley, 21. "I've struggled [to find] something to do that my anxiety does not screw up." The best part of the program, she said, is meeting new people. Rich learned about the academy through the Champlain Valley Office of Economic Opportunity, which oversees the Chittenden Emergency Food Shelf. Her husband, Arnold Parent II, had gone through the program about three years ago, she noted. He interned with Sodexo at the University of Vermont for a week and was offered a job — as a breakfast cook — at the end of his stint. The couple is saving up to operate either a restaurant or a food truck, Rich said. Not every academy graduate pursues a career in the food world, however. Just 68 percent of students from the last three sessions at the Burlington site have landed placements. But Logan isn't too worried about the numbers. "The course is bigger than that," he said. Sometimes, family circumstances prevent graduates from being able to work right away. 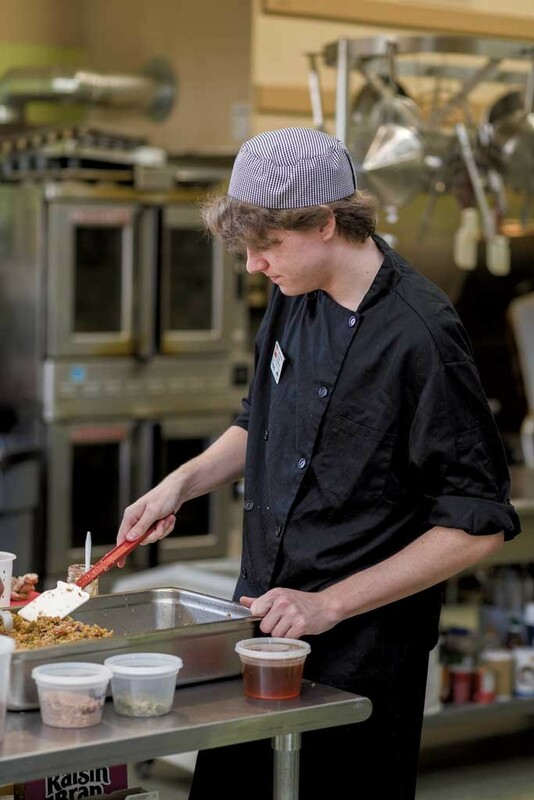 And even for those who don't pursue a career in food service, the program helped them to figure out their goals, Logan insisted: "In some ways, they've found out who they are." Though the academy has been around for almost a decade, there's room for improvement and expansion, said John Sayles, chief executive officer of the Vermont Foodbank. "It's a mature program, but by no means is it getting stale." Sayles would like to find a sustainable source of funding to hire a staffer who could provide personalized support to graduates and keep them connected to the academy. He'd also like to run the program in other parts of Vermont, such as Bennington, Brattleboro, Rutland and St. Johnsbury. "I hear from communities all the time that they want this," Sayles said. It costs about $200,000 to run the program each year at each site. "It's really about finding the resources to make that [a] reality." Academy funding to date has come from several sources, including foundation grants, the Vermont Department of Labor, the Vermont Student Assistance Corporation and individual donors, said Sayles. In Burlington, Meehan and Logan want to raise public awareness about the Community Kitchen Academy. "It's a challenge trying to spread the word and invite people to apply," Meehan acknowledged. Providing on-site interpreters "might be a great way to go forward," Logan suggested. He's also working to develop better relationships with food-service establishments in order to secure more internships and jobs for students. For instance, local butchers are increasingly in demand, he noted. Logan is also keen for the program to be more integrated into the community. "I'd like to see us do a barbecue and the whole Old North End is invited," he said. "We are more than just our elements. We are part of this community." The original print version of this article was headlined "Prep Work"